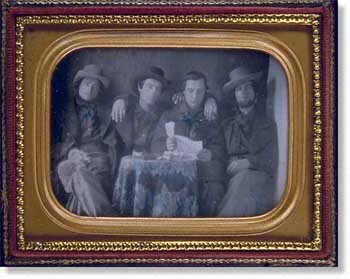 This unique daguerreotype illustrates the importance of letter writing in the nineteenth century. Without phones or other communications technology, 49ers had to rely on sending written notes to their friends and loved ones. At the same time, daguerreotypes themselves were one of the most important ways that miners could establish an emotional link with those they left behind. So this image -- combining the importance of letter writing with the importance of photography -- fully represents how meaningful it was for these men to keep in touch with their friends and families back home. If you could have seen us when we received our letters, you would have laughed and perhaps called us fools -- such hoorahing, jumping, yelling and screaming.... You will take good care and write often when i tell you that I live upon your letters, with a small sprinkling of pork and bread.